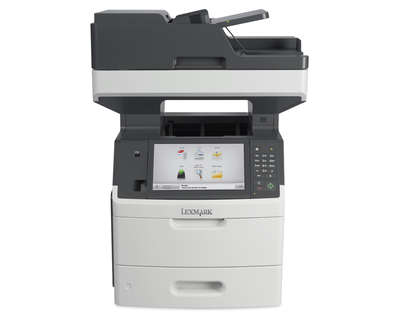 Print, scan, fax, and copy with the Lexmark MX711DE MFP. This modern multifunction device comes with a 10.2 inch touchscreen display for easy navigation. The Lexmark MX711DE printer is ideal for large workgroups as it has a monthly duty cycle of 300,000 pages and has an impressive print speed of 70ppm. It is integrated with 1,024 MB memory that can be upgraded to 3,072 MB and an 800 MHz processor. The Lexmark MX711DE black and white multifunction printer is quite expensive. The Lexmark MX711DE mono laser MFP comes with a 150-sheet automatic document feeder and a flatbed scanner. This model can handle a wide range of media including web, paper, and integrated labels, transparencies, envelopes, and card stock. The fax modem has a speed of 33.6 kbps and the transmission speed can go as fast as three seconds. For connectivity, Gigabit Ethernet and USB ports are offered. The Lexmark MX711DE all-in-one printer has a scanner with a maximum resolution of 600 x 600 dpi and can deliver 67 spm for monochrome and coloured on simplex mode. To help save time, the Lexmark MX711DE mono multifunction printer has quick performance and comes with a built-in duplexer for printing and copying plus an RADF for scanning. It also has a USB host and send-to-email functions. Toner cartridges for the Lexmark MX711DE laser printer can last up to 45,000 pages. The Lexmark MX711DE workgroup laser printer can handle a maximum of 3,300 sheets, which can help save time for reloading trays. Networking is easy with the built-in Ethernet. Expect this model to be pricey. The Lexmark MX-711DE laser multifunction printer is also rather bulky. The Wi-Fi connectivity is optional.